On 5 October 1962 – fifty years ago next week – The Beatles released their first single, Love Me Do b/w P.S. I Love You. The single entered the UK charts on 11 October and stayed there for 18 weeks, peaking at #17. Follow-up Please Please Me did better, reaching #2; that was followed by 11 straight #1s – bizarrely the group’s greatest single, Strawberry Fields b/w Penny Land, broke the streak (six chart-toppers would still follow). And apparently that was only because the BBC counted the record as two individual singles. So, to celebrate the 50th anniversary of The Beatles’ beginning their recording career, here’s the first of two Covered With Soul mixes of Beatles songs. One of the tracks here, ‘Til There Was You, was a song The Beatles themselves covered, but it I presume that The Smith Connection used the Beatles version, and not the original from the 1957 musical The Music Man, as their inspiration. These being soul versions, they tend to be quite different from their originals. I believe it is a sign of a great song if it can be interpreted well in many different ways. Every song here is beautifully re-interpreted, in some cases almost re-invented (check out Charles Wright’s take on Here Comes The Sun for that). Even Marvin Gaye’s take on Yesterday uses the composition’s flexibility to great effect. A great example of that flexibility is in We Can Work Out, which had been covered brilliantly by Stevie Wonder; his version is in every way the original’s equal. Valerie Simpson takes a rather different approach to the song, and produces a soul version that is very different from Stevie’s – and quite brilliant in its own right. And if Paul McCartney would sing Hey Jude (as he does seemingly at every opportunity somebody hands him a mic) like Wilson Pickett does, I’d gladly hear that blasted song over and over again. As always, the mix is timed to fit on a standard CD-R, for which homebaked covers are included. I’m afraid passwords are now necessary; you’ll find it in the comments section. The History of Country series will conclude with the next mix, probably in October. In the meantime here is a mix which includes some or all or none of the songs listed below, which are not in any way at all a tracklisting. The file which might include some or all or none of the songs listed below is PW-protected (see comments section). I think the track by The Beauty Shop might be my favourite song of the 00s, and the Bright Eyes track is from what might be my favourite album of the decade. And check out George Jones singing one of my favourite Merle Haggard songs. In the past I spread my soul selections over two years, or in the last instalment over four. Frankly, by that method, there is too much great stuff that must be left off. So from here on in we’ll run through the 1960s year-by-year. Many acts here are well-known, though not all were famous at the time the featured song was released. The Supremes’ Run Run Run, in which Holland-Dozier-Holland tried to go for the Phil Spector sound, tanked at #93 when it was released in February 1964. Their next single, Where Did Our Love Go, went to #1, as did the following four. Lou Johnson’s song would become famous in versions by other singers, especially Britain’s Sandie Shaw; Lou’s was the original (and here a special shout-out to the late Hal David seems appropriate). Meanwhile Hal and Burt’s muse, Dionne Warwick, chips in here with a song that conforms more to the girl-band sound that was already becoming passé. Though it was produced by Bacharach and David, Get Rid Of Him was written by Brill Building team Helen Miller and Howard Greenfield. It was only an album track and therefore not well-known. And lovely as it is, how could it compete with orther siongs from the LP, such as Walk On By, A House Is Not A Home, They Long To Be Close To You or Reach Out For Me? Talking of girl bands, Earl-Jean used to be the singer of The Cookies, who featured twice in The Originals series, HERE and HERE, while Earl-Jean did the original of the Herman Hermits’ hit I’m Into Something Good. And talking of originals, the Bessie Banks’ song Go Now was later covered by the Moody Blues. Bessie’s version was produced by Jerry Leiber and Mike Stoller. The Radiants were a Chicago group which included Leonard Caston Jr, who not only wrote the Mitty Collier song that follows The Radiants’ wonderful Voice Your Choice, but also hits such as Eddie Kendricks’ Keep On Trucking and The Supremes’ Nathan Jones, and played the piano on Fontellas Bass Rescue Me. The Radiants were once produced by the legendary Billy Davis (who wrote Rescue Me). Davis also wrote the song that precedes that group’s song. Listen to the lead singer of The Gems, who recorded on Chess – it is a young Minnie Riperton. Linda Carr would go on to become a popular singer in Britain in the 1970s as the frontwoman of Linda and the Funky Boys; featured here is the lovely b-side of her debut solo single Sweet Talk. Anna King had the distinction of being the only one of James Brown’s backing singers to have an album produced by the self-proclaimed hardest-working man in show business, with his band doing backing duties. Titled Back To Soul, it was also her only one. Come On Home is credited to Ted Wright – one of Brown’s pseudonyms. As always, the mix is timed to fit on a CD-R and indcludes covers. PW in comments. 25. The Sapphires – Who Do You Love? The headline death this month probably is that of Scott McKenzie. He was, by all accounts, a quality guy, so we’ll have to forgive him for co-writing the horrible Beach Boys hit Kokomo. His one big hit, the John Phillips-penned San Francisco (Be Sure to Wear Flowers in Your Hair), of course helped define a generation, except perhaps for the people of San Francisco, for whom the song was great tourism marketing but probably reflected little of daily life. Carl Davis, who has died at 77, was to Chicago soul what Gamble & Huff were to Philly and, perhaps, Berry Gordy to Detroit. Davis produced such artists as Jackie Wilson, Curtis Mayfield, Gene Chandler, Major Lance, Barbara Acklin, Tyrone Davis, Mary Wells and The Chi-Lites . His productions included stone-cold classics as Duke Of Earl, (You’re Love Has Lifted Me) Higher And Higher, Turn Back The Hands Of Time, and Oh Girl. Gospel singer Willa Ward died on August 12 at the age of 91. She never became as big as her sister Clara Ward, but as part of the Ward Singers, Willa and her sisters did much to influence future soul greats such as Aretha Franklin and Patti LaBelle. Willa also sang backing vocals for stars such as Little Richard and Screamin’ Jay Hawkins – and Patti LaBelle. First on our list is a hold-over from July: Jay Parker, who died at 87 on July 30, was the desighner of the iconic label for Sun Records, which did not change during the labels run from 1953 to January 1968..
Of course Hal David died on September 1, a day too late for inclusion in this month’s roll call. Check out the compilations of Bacharach/David songs HERE and HERE. To mark Saturday’s passing at the age of 91 of Hal David, lyricist of all those great songs composed by Burt Bacharach in the 1960s, I am reposting this mix, originally from 11 May 2008. Last year I posted a Covered With Soul mix of Bacharach/David songs to mark Hal’s 90th birthday; that link has been updated. 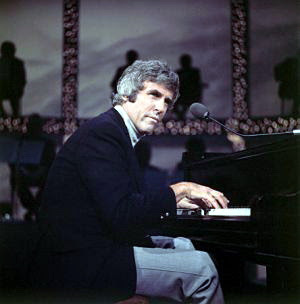 Happy birthday, Burt Bacharach. The great man turns 80 on May 12. To celebrate, here is a mix CD-R of songs by Burt Bacharach and Hal David (right). It is probably redundant to deliberate at length about Burt’s life and massive influence, other than to point out how incongruous it is that there were times when it was seen as somehow uncool to dig Bacharach’s music. That, to me, is the equivalent of coffee being declared socially unacceptable. Still, a few words seem necessary. Bacharach and lyricist Hal David probably were the most prolific Brill Building partnership; if others exceeded their output, then certainly not with as much success. And consider some of these Brill alumni: Goffin & King, Mann & Weil, Leiber & Stoller, Sedaka & Greenfield, Barry & Greenwich, Neil Diamond, Laura Nyro… The pair scored their first major hit soon after taking over a cubicle in the Brill Building in 1957: Perry Como’s “Magic Moments”. Over the next few years they scored a series of minor hits. The breakthrough arguably was meeting Dionne Warwick in 1961, who would become something of a muse for the songwriters. Warwick was to act as a demo artist on new songs which would then be given to others. Warwick’s interpretations, however, were usually quite perfect. And so many songs were written with Dionne in mind. Some of these Warwick be the first to record, others would be given to other artists first, to be covered later by Warwick (who had 22 US Top 40 hits with Bacharach/David songs). The triumvirate fell apart in the early ‘70s amid a flurry of lawsuits. Soon the Bacharach style became unfashionable, incongruously labelled as an easy listening merchant. That he wasn’t: many Bacharach songs are best heard as soul songs. Still, when Frankie Goes To Hollywood’s singer Holly Johnson wanted to record a version of (Do You Know The Way To) San José, his laddish colleagues vociferously opposed the idea. In the event, they did record it, and their version is quite lovely. Arguably this was a significant step towards the rehabilitation of Bacharach which was complete by the late 90s, with even the likes of Oasis’ chief plagiarist Gallagher (Liam? Noel? I can never tell them apart. The one with the mono-brow) paying tribute to Bacharach. Bacharach had made something of a comeback with a few hits in the 1980s, co-written with wife Carole Bayer Sager, such as Arthur’s Theme, On My Own and Dionne Warwick’s comeback saccharine hit That’s What Friends Are For (as so often with Bacharach and Warwick, it had been previously recorded, by Rod Stewart for the soundtrack of 1982’s Nightshift). Bacharach went back to his roots, in a way, when he composed, with occasional collaborator Elvis Costello, the song God Give Me Strength for the 1996 film Grace Of My Heart, which was loosely based on Brill alumni Carle King. Bacharach’s 1998 album with Elvis Costello, Painted From Memory, was a patchy effort, as was his 2005 solo album, At This Time. Incidentally, Burt’s unusual surname is German; there is a town called Bacharach in the Rhineland. On this mix-tape (timed to fit on a CD-R) I have tried to mix well-known versions with some that are less famous. Soul singer Lou Johnson recorded several Bacharach songs before they became hits, though Kentucky Bluebird (later a Warwick hit as Message To Michael) was recorded by fellow soulster Jerry Butler a year earlier. Lyn Collins in her 1974 recording proves further that many Bacharach songs are really soul songs, as do Aretha Franklin and Isaac Hayes (of course, Warwick’s version of Don’t Make Me Over left no doubt about its place in soul history). Although absent from this set, Luther Vandross also was an outstanding interpreter of Bacharch. While most of Hal David’s lyrics capture universal emotions with great perception and imagination, a few were shockingly sexist, at least by our standards today. I have deliberately appended the two worst offenders (one always sung by women) at the end.